Since I have some forced downtime on the plane on my way to Boston, I finally have a minute to write an update! After a 2-week break following Kona, I have been getting back into training during the past couple weeks. This time is unfailingly painful, but I always remind myself that the only way to get through it is to go through it! The good news is that I feel a bit more fit every day. I am now on my way to the East Coast for 10 days. My sister is a second-year law student at Harvard, and I like to visit her there at least once a year. But I find that being in the city, while still training, just being bit out of my normal training regime makes me start feeling a little less like a “real athlete”–which, in turn, makes me…..not happy. So I decided I ought to find a way to really give it to myself at some point over the course of this trip so that I’d be much more fun to be around! But let’s be honest, my motivations were not entirely altruistic: I just like to give it to myself. I am really looking forward to running for several hours. While I do some pretty big run training days, I’ve only once done 50 miles. It was in 2001, and since I am stuck here in 27B 30,000 feet in the air, I’ll tell you about running a 50-miler 6 weeks after my first standard marathon….. So, effectively, I started running (I use the term loosely.) on August 14, 2000. I forced myself through those first weeks during which just moving forward in a running motion was enough to precipitate a complete sufferfest. But I got through it, and the runs became longer and more fun. My best friend Colleen and I ran every step of our first marathon together at Cal International in December of that year. We crossed the finish line in 3:49 and couldn’t believe how fast we were! :) We had just hoped to break 4 hours. After this big success, running 50 miles seemed like a brilliant idea. I didn’t allow myself to be deterred by the fact that this run was to be January 13, 2001–just 6 weeks after my first marathon, or 5 months into my running career. No, common sense was not going to get the best of me! I was determined to do an ultra and even more motivated to do it on this particular date. Those who are familiar with the Catalina Marathon can understand that I hadn’t chosen a cruisey intro to ultramarathoning. This was a bloody hilly course, but I loved every minute of my nine hours and forty! It was a very painful kind of love for those last several miles, but at the time I was just so impressed with myself for going the distance that my elation outdid the physical suffering. And after those nine hours and forty minutes, I figured that it might be possible for me to complete a few more hours if I divided the time amongst three sports. With that thought in mind, I entered the 2001 Ironman Florida. But we’ll save that story for another day. I just wanted to let everyone know that my Hawaii race report is finally available in my “Rolling Reports” section. Also, we are working on a way for me to post updated blogs myself, so hopefully this section will soon be more current. After a two-week break with just one or two easy training sessions each day, I am in Tucson building back into training. Although I probably won’t race another triathlon until Challenge Wanaka on January 19th, I have some fun off-season entertainment planned. On November 17th, I will run the JFK 50-mile Ultramarathon in Maryland, and then on December 2nd, I get to run my hometown race: the Tucson Marathon. I am looking forward to using these events to build my running fitness, and of course, to give it to myself. I have some exciting news to share: I’ve got two iron-distance races on the schedule for next year already! I’ve just committed to race both Challenge Wanaka in January and Challenge Roth in July. After a fantastic experience in Wanaka last year, I could not wait to return and do it all again; it was a unique and challenging course, and the race had a family feel that one does not often find at big iron-distance races. Roth is a legendary race that everyone has told me I must experience, so I am thrilled to have the opportunity to participate next year. Plus, both experiences guarantee me heaps of quality time with two of my favorite people, Belinda and Justin Granger, who are responsible for getting me hooked on the Challenge Series in the first place! And the Wanaka race in January gives me a much-needed excuse to return to New Zealand; it has been over 6 months and I am having serious withdrawals! I have officially re-entered the not-good-for-much-of-anything-besides-training zone….But the good news is that my body has bounced back quickly from Ironman Wisconsin, and I’ve been able to get some good, hard training done this week. And I have finally finished my Ironman Wisconsin race report, which is now posted in the “Rolling Reports” section of this site. Along with that report, however, I have to share what was for me the most exciting bit of that race weekend: the Big Kahuna Half Ironman in California, at which my three athletes racing all destroyed their PRs and took their racing to a new level. I could hardly believe my eyes when I was reunited with my crackberry soon after the race in Madison and saw a text from Jon that said…4:44?! This from the guy who didn’t believe me when I told him he was going to break 5 hours! And soon the rest of the news came in: all three had done their fastest half ironmans by at least 15 minutes, with David deep in the midst of Ironman Florida training. In case you can’t tell, I still haven’t stopped bragging about their accomplishments–I think mostly because I’ve seen the hard yards they have put in to take their performances to a new level, and I am so excited to see that work pay off. So…details of ironman #7 for ’07 can be found in “Rolling Reports,” and I will be back in touch soon! Since the race, I am rediscovering my new home in Tucson, Arizona. I was glad to come home to temperatures in the mid-nineties because I haven’t spent much time in the heat in the past couple of months, and I might as well get used to it a bit before Kona! I was not so glad, however, to find many remaining unpacked boxes that I did not have time to deal with before I left the country in June! Ugh. I just had a quick 2-day trip to Los Angeles for a fitting for my Kona kit with Splits:59. Splits is a new women’s multisport clothing company that I have been fortunate to be involved with since the beginning, in many aspects of its development. You will soon be able to visit their website and their store in L.A. During my visit to the Splits headquarters on Friday, I was able to see even more of the pieces in their first collection, and each one became my new favorite. It was really exciting. I will keep you posted here on the launch dates for their website and store. After recovering from a very swollen knee that resulted from my total wipeout 3 blocks from the finish at Wisconsin, my body feels great! Besides seeing my parents and meeting with Splits, I was able to squeeze in a couple of favorite training sessions in LA: a beautiful, hilly, trail run in the mountains above Santa Monica, and the Hermosa-Manhattan Beach pier-to-pier swim in the Pacific. I had gone nearly 3 months without seeing an ocean, which is not normal for me! So of course that was a highlight. I am back in the USA again! It was very, very sad to leave my squad, but I took heart in the fact that we will be having mini-camp in Kona in just over a month’s time. I was also quite excited to return to the Midwest. Having spent my first year of uni in Michigan, and made many return visits, I have a special place in my heart for this area of the country. Verona is the location of much of the Ironman Wisconsin bike course, and I’ve been lucky enough to have an extended homestay out here for two years now. Both this year and last, I have come out to Wisconsin early in order to give myself time to get over the travel from Europe and train on the bike course a bit. I love training here; it’s beautiful and quiet, with very friendly locals and great coffee shops, too! I am really excited to race next weekend; when I start thinking about it, I can hardly wait to get out there. But I am just trying to take one day at a time and make the most of each. Ironman UK already seems like a lifetime ago, and for me, that’s good news. If I sat around celebrating my last race, I wouldn’t be ready for another in close proximity. But racing two ironmans three weeks apart does make me very conscious of making each session and each day count. Of course this is how we should always think about our preparation, but this timeframe does sharpen my focus. On that note, it’s time for a spinach salad, and then a swim! I will check in again soon. Ironman Austria seems like a distant memory now, as I’ve done a lot of training since I arrived home early last week. But I wanted to let you know that I’ve finally posted my race report in the “Rolling Reports” section of this site. We’ve also added to the press section a recent article I wrote for Triathlon Canada magazine. Enjoy! I arrived here in the mountains last Tuesday night to cold temperatures and a day of rain, but yet I felt right at home! As soon as I was reunited with the first of my squadmates that night, all was right with the world. While walking around our beautiful mountain village the next morning, I felt more content than I had in a long time; I realized that it was because I was home. While I’ve always identified some location on the western side of the United States as “home,” the distinct change in my disposition upon my arrival at camp enabled me to let go of that idea. I recognized that I am my best–and thus happiest–self while with my training partners and coach in some remote location with nothing to worry about but taking care of business. I can never just throw my dirty clothes into the hamper immediately following a session; they are always so drenched with sweat that they must first be hung to dry! I run repeats on the track until I blow…..and then keep running. When the going gets tough in a session, or I feel like eating some junk food, I have to just look around at my training partners and am inspired by their determination and perseverance. They give me strength, as just being with them makes me want to do whatever it takes to be a better athlete. my old friend, Matty Lieto. more than 12 hours–my previous best for a week. days followed a similar pattern…. for 10 hours straight besides exercise, and that is to talk on the phone! still 100 degrees out! It was not pretty, but it was done! I am just getting ready to leave early tomorrow morning for Clear Lake for this weekend’s 101 race. With Ironman Brasil two weeks ago, this will be the biggest double I have attempted, and I am looking forward to it! You can follow the race Sunday morning on www.slowtwitch.com. I also wanted to let you know that I’ve finally posted all of the gory details of my Ironman Brasil experience in my “Rolling Reports” section, and have even put a couple new pictures up in the Gallery. However I had many flight issues on the way home, so my trip took two days, and I’ve only just arrived at home in time for my parents to arrive for their first visit. I will be back at it in Clear Lake next weekend for the 101 race. More soon–after my weekend with my parents. It was a great weekend in Florida! I am once again on the plane–now heading back home to Tucson–but I wrote a report of my experiences at the first-ever Tri One-o-One race, and you can find it posted in the “Rolling Reports” section of this site. I just wanted to send a quick update from the plane on my way to Florida for the inaugural Tri One o One race in Bradenton. Needless to say, I cannot wait to race again!! I’m also looking forward to catching up with a lot of friends who I haven’t seen in awhile–and especially to my visit with the Gollnick family. Heather lives in Bradenton and graciously volunteered to play 101 sherpa for me for the weekend. This has been an eventful week for me. I finished a massive training week and then jumped on a 5am plane Monday morning for Tyler, Texas for a two-day visit with John Cobb. For those who are not familiar, John is the brains behind all of the cool Blackwell Research technology, and the bike-position MAN. This season I’ve had the privilege not only of racing with Blackwell equipment, but now of John’s expertise. Despite the fact that I’ve been cycling better than I ever have before (Yes, it’s all relative! :)), my coach saw pictures of me on the bike at Ironman Arizona and told me to get on the bike position project ASAP. So John and his lovely wife Ginger were kind enough to host me for a couple of days while John worked his magic. During this time, I rode my bike inside and outside, jumping on and off every few minutes while John adjusted back and forth countless details: seat height, stem length, aerobar angles, aerobar pad placement, etc….He also gave me some priceless tips on technique, which everyone who has seen me ride can attest that I am in dire need of! We ended up with a position that both of us are pretty pleased with, and I am looking forward to seeing how I progress over the next few weeks after the benefit of John’s insight. Of course I squeezed in my training during my brief trip to Texas, with the highlight being my Tuesday afternoon duathlon in John’s garage and around his little neighborhood. I was testing out the ORCA swimsuit for my race this weekend, and ended up so completely drenched with sweat after my time trial on the turbo that I couldn’t be bothered to put shorts on over it again….So naturally I ended up running laps around John’s neighborhood in just my swimsuit, like a proper triathlon–and of course, it was pouring rain. The next stop on Hillary’s Duathlon World Tour will most likely be Doug Friman’s workout room, Tucson, Arizona, USA. With the merits of the ORCA swimsuit thus being proven, however, I will likely resume training in my standard attire of the Splits:59 booty shorts and sports bra. I did get ahold of my luggage Wednesday afternoon and even managed to have great runs that day. Yesterday it was time to start getting organized to leave town again, and today here I am again on an airplane. What would I do without this crackberry?! I’ll report in again after the race. I am writing from my new home in Tucson, Arizona! Last Friday I made the drive from Santa Monica to here; rolling in a 14-foot U-Haul does make the journey quite long, especially when you factor in the obligatory time stranded on the side of the highway in the middle of the desert after running out of gas….Yes just five days after my quality time roadside during Ironman Arizona, I found myself having flashbacks. However, I am pleased to report that help arrived a bit more quickly on the I-10 than it did on the Beeline Highway in the Ironman…but I’ll get to that Ironman story in a bit. When I finally arrived at my new place last Friday afternoon, thinking I was meeting my realtor to get the keys, I was met with a proper welcome party. My girlfriends Sherry and Dana walked out front with party cups in hand, and I entered my new place to find that they had not only set up a little happy-hour party in my place, but had hired movers to unload the truck. They had even stocked my fridge with everything I’d need to get me through the next morning’s group ride! Talk about making a girl feel welcome! Within two hours, my furniture was set up and my bed was made. It was amazing. I fully expected these tasks to take me weeks to accomplish. Since then, I have been reveling in the novelty of having my own place and my own space! I think my stress level dropped in half within a day of being out of Los Angeles. I am loving being able to drive 3 minutes down the road to a pool and having great running and biking straight out my door. My unpacking progress has slowed, however, as I was able to get back into fully giving it to myself in training this week, and haven’t had time for much else besides resting between sessions! I have quickly reacquainted myself with my best friend: Dougie’s treadmill. Yeah Dougie is great, but his treadmill-I can hurt myself pretty bad on that thing! Had lots of pain and suffering on it this week. Loved it. Okay, now for the few remaining people who have not heard the story of my fun-filled adventures in Tempe two weeks ago, I will tell the short story for what I hope is the last time. This one doesn’t merit a “race report” in my “rolling reports” section, as I was truly “racing” for less than two hours. Race morning I went to pump my tires and was a bit alarmed that my back tire only had about 30psi in it. I had pumped it the day before, so I thought this was a bit strange, but convinced myself that as it wasn’t totally flat, it was probably fine. Isn’t the idea of running around trying to change a tire 45 minutes before race start what we all have nightmares about?! I now know that scenario would be well worth the stress. Standing on the side of the highway feeling helpless while watching my race pass by, and then pass by again on the next lap, was more stressful than the alternative. Next time I will be a bit more concerned before the race! Sometime after the bike turnaround on the first lap, I noticed that maintaining my pace was noticeably more difficult. This was about the time that Heather, Lisbeth, and Katja passed me, so I convinced myself that it was all in my head. However, after I hit a couple of bumps and bottomed out, I thought about that low tire that morning and my heart sank. I pulled over, and sure enough, it was nearly flat. Long story cut short, for whatever reason, the valve extenders from my race tire wouldn’t screw into my spare, and with 100mm wheels, I was stuck–helpless. So there I stood on the side of the highway, thinking that a tech support car would show up within a few minutes. Near tears, I counted the minutes ticking by, counted places lost, and contemplated how I’d make up this time. When no help arrived, I decided that it couldn’t hurt to walk to the penalty tent on the horizon-at least I’d feel like I was doing something productive! As it turned out, this little walk didn’t seem to improve my situation any, as I then just proceeded to stand looking and feeling quite pathetic and helpless there by the penalty tent for a very long time…over an hour, to be more precise. After about 45 minutes-or whenever it was that I saw the girls I was racing with ride back past me on their next lap–I realized that my “race” was done. At this point I went from being on the verge of tears to forcing myself to laugh at my situation. It was going to be a long day, and being in a bad mood certainly wasn’t going to help me or anyone else. Tech support finally arrived and was unable to fix my tire, so they switched my cassette over to a wheel that they had in their truck, and off I went. After an hour and twenty minutes roadside, I was back on my bike and dealing with the realization that I was only at about mile 25 of the ride…This thought was initially overwhelming, as it was coupled with the knowledge that I was out of the pro race. That is, while I always trust that anything can happen and any number of girls ahead of me could have their own dramas and drop out, after 1:20 roadside there was no mathematical way that I’d be able to come within the requisite 10% of the second-place time needed to earn a paycheck. Thus I had some strategic decisions to make. As most everyone knows by now, I made a decision when started this sport that I would never drop out of a race, barring broken femur issues. Heck I’ve crawled with a broken hip until I was pulled off the Ironman New Zealand course a couple of kilometers before the finish; after risking my health like that (not necessarily advisable), I certainly was not going to let a silly mechanical issue force me to compromise my principles. Despite the fact that my peer group has changed since I started this sport and it is easy to become a bit jaded when it seems like everyone around me is an ironman champion, I try to remember what this sport was about when I first started-finishing-and to not take this accomplishment for granted. Although I wouldn’t be winning any awards that day, I could still give myself the gift of an ironman finish. When we step back from our insular little ironman-world for a minute, it’s easy to see that crossing this finish line is no small feat. I did have to make a difficult decision, though, which was to jog the marathon. It seemed wrong to just be jogging and not really “racing” on a race course, but after much mental debate during the remaining hours of my bike ride (which I thought of as a hard training ride), I concluded that although smashing myself on the run would provide me with instant gratification on some level, it wouldn’t be very smart. After all, this is my job and there are races on the horizon for which my training would be somewhat compromised for a couple weeks as I tried to recover from a fruitless hammerfest. So I left my gels in T2 and set out to give away my remaining energy to all those around me who were still racing. After all, there were many PRs, Kona spots, first- and tenth- ironman finishes still to be determined out there. For the first 21 km, I thoroughly enjoyed myself, cheering people on, looking for my friends on the course, and making new friends. I would be lying, though, if I said I enjoyed the last 21km. Maybe this is because by that hour in the day I am accustomed to being done, or because it was finally hitting me that this race that I’d felt so confident about and looked forward to for months was coming to an end, and did not resemble the race that I’d imagined…In any case, that last half marathon was loooong. My cheerleading skills were mediocre at best, but I still made an effort. Nevertheless, 11 hours and 33 minutes after I’d started, I crossed the finish line. My friends and family, who had come to Tempe also probably expecting a different sort of day, were all still there…In short, my life was all still there, just as it had been before I had started. My relationships with my loved ones and my principles were intact. And I’d just had 10+ hours of exercise in the sunshine-there really are no “bad” days at this job. Hi! This will be quick as Lisbeth and I are getting ready to leave Palos Verdes for half of our drive to Tempe this afternoon. But I have been meaning to pass along a couple of websites in response to questions I have received about my sponsors. First, I am excited to share our team’s new website, which has a lot of cool interactive features, and tons of information about all of the characters who figure prominently in these diary entries. Now when I talk about someone, you can most likely find his or her profile on the Team TBB website. Here is the link: www.teamtbb.com. Anyone can get a login and password and join in the forum discussions on the site as well. I also wanted to respond to inquiries about these “miracle shoes” that I often mention. They are a new running shoe technology made by Newton Running Company, and Newton is finally taking orders! Lots of my friends have already ordered them. For those who didn’t get to check out the Newtons at the California 70.3, their website has all of the shoe and ordering information: www.newtonrunning.com. You really have not seen anything like this before in a running shoe, and I warn that once you try them you won’t ever go back! Well I am off to Equinox here in Palos Verdes for my last treadmill session before our trip. I have to thank my friend Nathan Cook at Equinox for letting me make the gym my home while I’ve been here. I’ve had a lot of quality time on Equinox’s treadmills, spin bikes, and in their 25-meter pool. I only wish I weren’t always in a rush when I train there, because I could spend all day relaxing in the steam room and other facilities. This place is amazing–hands-down the most first-class gym I’ve visited. Hope to see many of you in Tempe. I have been looking forward to this weekend for a long while, and expect it to be a lot of fun! For those who won’t be there, you can follow us online on Sunday at www.ironman.com. I returned home on Friday afternoon but still have yet to make it “home.” It seems now that every time I come back to the States, I return to a whirlwind, and I’m beginning to get used to it! After my long flight from Auckland, I was met with two of the things I miss most about the States: my amazing friend Jon and a no-sugar-added vanilla soy latte, which he had in hand. for it in training for the next week, so Jon helped me keep the training at a conversational pace. His parents took wonderful care of us for two days before we headed back down south to begin the nonstop-mode that has come to define my brief visits home. Sunday night I had the pleasure of speaking at the American Interbanc Tri Club’s monthly meeting. I met a lot of great people and enthusiastic athletes, and shared with them a bit about my ongoing journey from my 12:29 first ironman five years ago. They asked a lot of fun questions, which brought back some fond memories of crawling on an ironman course and other such seemingly-distant events in my not-so-distant past–in fact, thinking back gave me an even greater appreciation for where I am today! Then Monday morning it was time to get back to properly giving it to myself in training, so I was up at five to cram in two sessions before my flight to Tucson for a power-shopping trip. And by that I mean that I intended to find and purchase a house in the span of 48 hours. This is the kind of time (or lack thereof) that I have to deal with when I have all of 3.5 weeks in the country in five months! I am very excited to report that the mission was accomplished–thanks to the extensive groundwork done beforehand by my amazing assistant Jules and my dedicated Tucson friend Dana, who also held my hand throughout the whole process this week. With almost no interruption to my training, I bought a townhouse in the same area as I lived and trained last fall. It will be really beneficial to have an optimal training locale to come home to, and to have all of my belongings organized and in one place in the States. I’m now on the plane back to Los Angeles for a fitting with my clothing sponsor, splits:59. Two races coming up means lots of cute new clothes! I’m always excited to see what they come up with next. Hope to see many of you at the 70.3 this weekend, or Ironman Arizona in two weeks! Hi! I am still in New Zealand for a couple more weeks, taking advantage of the great training setting here, while spending time with Guy in Napier. And of course he gets the pleasure of lots of training as well….very nice of him, really! Ironman seems like quite awhile ago, as I am already back into it. I just wanted to let you know that I’ve finally finished my race report and posted it to the “Rolling Reports” section…More soon. I just wanted to post a short message here to tell everyone that I am alive and will be back in contact soon. I’ve been at training camp with my squad in Phuket, Thailand and then in Taupo, NZ for Ironman–and my beloved “crackberry” has been broken. So besides being too tired to write while at camp, I have had severe technical difficulties. But I wanted to thank everyone for their kind emails, and to let you all know that I will be in touch soon. I should have time to catch up this week, as I will have a bit less training to do than usual. I will post a full race report soon, but wanted to let you all know that I haven’t lapsed into some sort of depression as a result of not finishing on the podium here. People seem to be concerned about that, but as I always say, one cannot be married to place-related goals because that puts the measure of one’s result on others–and what they do is largely out of our control. Given the caliber of athletes I was racing yesterday, I knew very well that I could have my best race yet and not finish on the podium–and that is what happened. Jo, Heather, and Kim were very strong yesterday, and created what I found to be a very fun race environment because of what we forced each other to do out there. I think we all pushed each other to get the best out of ourselves; Jo dominated all day, and Heather and Kim busted out serious RUNS! I’ve been working very hard on my bike and was glad to see some progress there, but it put me in position to be run down, whereas I am usually able to move my way up on the run because of the damage I’ve done to my position on the bike. So while getting run down is never fun, my bike and run marked progress for me, and a step in the right direction heading towards the big goal on October 13th. Full report to follow…. I will have a proper race report up soon, but in the meantime, I wanted to check in and let everyone know that I am alive! And also that I am a bit behind in my correspondence because my blackberry has not been getting email service since the airport three weeks ago. It was a state of national emergency for a time, but I am gradually adapting to life with email access only every couple of days–if that! We had a fantastic last couple of days in Wanaka after our race. The post-race celebrations began with pizza and coffee with Luke–the men’s champion, and proud Sutto squad member–after the press conference. Thus began my two post-race days of eating all of the stuff I normally can’t…Then we were off to the finish area to meet Belinda, Justin (1-2 for my favorite husband and wife team!) , and Kieran to welcome home the last three hours of finishers. This is always one of my favorite parts of the day. The atmosphere at the finish was awesome: fun music, an enthusiastic announcing team, and tons of spectators. The whole town and neighboring communities seemed to have come with their entire families. There were kids everywhere who were beyond excited to be there and stay up til midnight. We had limbo contests (yes, painful) and Luke provided us with no end of entertainment by a variety of antics–such as some form of square dancing with a group of young children–all of which were conducted while wearing a handcrafted bandana made of plastic QUELLE finish-line tape. He’s only new to our squad, and yet we can’t seem to remember what we did for entertainment before he arrived! The finish-line festivities were capped off with an amazing fireworks display during the last ten minutes before midnight, which coincided perfectly with the oldest finisher (70) crossing the line with just a few minutes to spare. By this time, I believe there were a couple of thousand people at the finish–and there was hardly a dry eye in the house. After that refreshing night, our day on Sunday was packed until it was time for the awards party. My training partners and I had a long, coffee-and-carbohydrate-filled breakfast with the ORCA team and some other friends at one of our favorite local spots. Then Belinda, Justin, and I went with Belinda’s parents, who are now my adopted parents in the Southern Hemisphere, to a wine-tasting at a local vineyard on the lake. The vineyard sits along a trail that Belinda and I had covered in nearly every run over the past couple of weeks, and each time, we’d motivate ourselves by discussing our post-race celebration plans. Of course they were all a bit more ambitious than what were actually capable of doing once the time came, but we tried our best! After this, it was time for awards. The organizers put on a beautiful, first-class dinner in an airplane hangar at the local flight museum. This was followed by party at a bar in town, which they had opened especially for us until 3AM. I lasted until nearly 1, so that was pretty big for me! After just a couple of weeks, though, I felt like I had so many great new Kiwi friends; knowing that I will see most of them again in Taupo at Ironman made leaving much easier! But I will definitely be back to Wanaka next year. It is nearly time to get the show on the road! I am almost done with my second day easy–one more to go–and I am looking forward to the chance to give it to myself on Saturday. I cannot wait for that hard-earned feeling of total-body pain/incapacitation that inevitably follows an ironman-distance race. Regardless of my time or place, if I can attain this feeling, the day has been a success, and I am thrilled. But there are many hours of work between me and this feeling, so I won’t get ahead of myself. I just wanted to check in and report that we are having a beautiful week in Wanaka. I love these days before the race when I get to catch up with friends from around the world. The Epic Camp crew rolled into town for a couple of days, and it was great to see some friendly faces–especially Brandon, whom I coached early in his career, and now makes me so proud doing 60-hour training weeks with Epic. It is awesome to see how far he has come. It will also be awesome when he helps me clean and race-ready my bike tomorrow…. This afternoon we had the opportunity to talk with a very international crew of media at the press conference. Apparently the Challenge group does not mess around when they do an event! I cannot wait to do Challenge Roth someday as well. Speaking of media, you can find online race upates beginning at 7:30 AM Saturday here and at 10:30 AM Friday PST. There will be a link to this coverage at www.challenge-queenstown.com. I will report in after the race! I had high aspirations for writing regular updates from Wanaka, but before I could get a first one written, we were back into smashing ourselves to the extent that I’ve been feeling like I can’t put two brain cells together once I’ve finished the day’s training. So here I am, ten days into my trip, with a “swim-only” day, and it feels like the hamster is at least ready for a little walk in the wheel upstairs…. I should provide a bit of background for those who aren’t familiar with the Challenge race series and think that I’m here for Ironman New Zealand already! : That race is in March-on the North Island–and I may well be back for it. But next week we have a new iron-distance race here on the South Island, in a small lake town called Wanaka, about 60 kilometers from Queenstown. This race is called the Orca Challenge Wanaka, which is the second race in what will be a series of Challenge iron-distance races. The first is the well-known Quelle Challenge Roth, which takes place each summer in Germany. Let me just start by saying that we couldn’t have asked for a better setting for a new iron-distance event!! From the moment we arrived, Belinda, Justin, and I have been pinching ourselves at our good fortune in choosing this race. I’ve done a fair few ironman races now-many in beautiful locations–but this is the most picturesque race course I have encountered. As I mentioned, we’ve done a bit of training in the past ten days, and I think it’s safe to say we have sussed out every inch of the course a few times over. After training in Southern California for a few weeks, I am loving being able to leave on a ride and not have to unclip for hours! Besides the long, open roads, riding along this course affords views of what I’d always imagined that I’d see in New Zealand: blue-green lakes and rivers, waterfalls, snow-capped mountains, and vineyards. I should have some pictures posted on www.k226.com by the time you are reading this. Belinda and I have gone over the run course four times in the past few days, and have decided that in addition to being our favorite run course, Wanaka provides the hardest iron-distance run course we’ve found. About half of the two-loop run takes place on trails, and half of those are fairly technical single-track ones. After this section, we have a few miles on the road with a series of challenging climbs. But as I’m running through the wooded trails along the lake, I just keep thinking about what a cool experience it will be to do an iron-distance race on this sort of course. I am really looking forward to the mental training that we’ll get out of this race, because with just about 80 individuals participating, it will likely be a lonely ten hours out there. After getting accustomed to racing with 2000+ of my closest friends every time I do an Ironman, this will be a unique experience. I can’t wait! As I write, I am en route to Wanaka, New Zealand. I am beyond excited to be reunited with some of my training partners and to return to a distraction-free training environment. Belinda and Justin Granger will arrive today also, and I am looking forward to a couple weeks of solid work before our race on January 20th. It was a nice surprise to be able to spend the holidays at home with my family, but on the whole I find this time of year to mandate a bit much sitting around and eating junk food for my taste. I get very antsy, and squeezing in all of my daily training sessions becomes a challenge. This, in turn, makes me grumpy! And given that I spend most of my time out of the country, I have limited time with my family, and would rather not spend this time being crabby. So, given that overeating and time constraints are almost inevitable, I’ve found that my best way to deal with hectic holidays is to schedule at least one epic training session in that timeframe. If I can get this session done, it seems to mitigate my annoyance at other aspects of the holiday that are at odds with my normal regimen. Last year, when I was first working with Brett, and was with my family in Northern California for Christmas, “Santa Sutto” allowed me to run as long as I wanted on Christmas day. I was so excited. He had been limiting me to an hour and a half up until this point, so when Christmas day was freezing and pouring rain nonstop, that wasn’t about to stop me (and my aunt and uncle didn’t exactly have any treadmills handy). I went out and ran for over three hours, and I remember being so shocked that my body lasted that long, but I thought that it might have been because I was completely numb! The loop guarantees an honest effort, and besides, I kind of love when I see people out there and they yell at me to tell me that I’m crazy. My swimming partners, German short course pros, Andreas and Michael Raelert, are fixtures on the biking loop; I’m guaranteed to run into them and have a bit of entertainment or at least brief harassment at some point in the run. Being short course guys, they never have to do any runs of this distance, and at first didn’t actually believe that I did this run, so I have to laugh every time I see them out there. But I couldn’t even do that…Two weeks after Florida, I jumped right back into an ambitious run schedule, and my body had a freak-out. I think it didn’t know what to do after I had given it 10 easy days for the first time in 12 months. month–and am back to a proper training schedule–so all is well with the world! I prefer training down south, so I have been spending most of my time down there, and visiting my family in Palos Verdes on the weekends. It will be great to be with my family for the holidays, but I am pretty much counting the days til I get to join Belinda and Justin Granger in Wanaka, where we will race the new Ironman on January 20th. I just returned home from a beautiful run along the Charles River here in Cambridge, Massachusetts. Now that my legs are back underneath me a bit, it took all of my self-restraint to limit myself to an hour; exploring a new town by foot is one of my most favorite activities. I am here visiting my sister, who is a first-year law student at Harvard. This visit was the first item on my agenda during my brief post-season “rest,” because I have not seen Cameron since she visited me at training camp in Switzerland in July. I was very anxious not only to see her, but to get a better sense of her life here and meet all of her new friends. Last night I had to leave the bar-hopping to the kids and come home after dinner to catch the tail-end of the ITU Tricast of Dougie’s World Cup race in New Plymouth. P.S. Yes, I am a huge dork. I LOVE the Tricast; it is pretty cool to be able to get live coverage of a race halfway across the world. And then while I was watching the women race first, I was getting emails from Dougie; I was like, “I’m sitting here waiting to watch your race—shouldn’t you be out there?” But he was sitting inside trying to stay out of the cold rainy weather—probably a good idea since he has maybe 1% bodyfat….Anyways, I felt like my New Plymouth spectating experience was thoroughly live, which was nice because I get quite antsy when my friends are racing half a world away. November 5th, 2006: Mission Accomplished. It’s 5:45 AM the morning after. I just wanted to check in, and will write a full race report soon. Right now I am enjoying one of my favorite aspects of Ironman: that hard-earned feeling in which your body hurts to lie on itself because every part of it is in pain. It is an impediment to the post-race night’s sleep, but I wouldn’t have it any other way, because for me it always serves as confirmation of an honest effort. I am also taking a moment to appreciate what I have accomplished this season. There is a fine line between complacency and appreciation, I think, so while in the midst of this season I always tried to mentally give myself credit for the improvements I was making while continually assessing where I could improve. After yesterday, I have already filed away some “notes to self” about goals for next season and areas that need work; but with this season done, I am giving myself a few days just to appreciate being a different athlete than I was a year ago. While I was running on the out-and-back course yesterday, I had flashbacks to the last time I did this course: my first pro Ironman in 2004. I finished in the middle of the women’s field, and that was a great race for me. Last season’s results were in this vein, with the highlight being a 7th at Ironman Arizona…..But being back on this course really gave me a chance to have a glimpse at where I was racing just a short time ago: I could literally see the people who I would’ve been running with and about where I’d be running. My race yesterday was far from perfect, but this vision put things in perspective, and in the end, I did what I came to do: finish my 6th ironman of the year and stay inside the top 5. The podium finish was a great bonus, too! I thought that this would be a banner year if I earned one podium, so to have four and two more top-fives is far beyond my wildest expectations. Yesterday I got to do my last big, hard pre-Ironman workout–on a race course at the SOMA Half Ironman. I loved racing in Tempe again; the setup looked just like the Ironman, and running on that course brought back many fond memories of my first Ironman podium there a few months ago. With Ironman Florida following just 6 days after the SOMA race, my coach presented me with a bit of a strategic challenge: I was not to leave it all out on the race course. Specifically, Sutto instructed me to “cruise, and I mean cruise!” the bike ride. I have never gone into a race planning on not leaving everything on the road; I’m not talented enough to do that and go well, and furthermore, I define success in a race as giving it everything I have. If I do that, I have to be happy, regardless of place or time. But the point of this race was to have a workout, and these were Sutto’s instructions. He didn’t mind if I lost, as we both knew there would be bigger battles to fight next weekend. It troubled me to know that I had to hold back a bit in the race, but Sutto is the boss and I am under no delusions that I’d have any top-five finished this year without following his instructions….. So after a strong effort on the swim, I had to swallow my pride while I watched the other girls putting time into me on the bike. It was not fun. I started to think I might’ve preferred to do this last big session in the privacy of the mountains and Dougie’s treadmill here in Tucson! But then I thought that I was just ensuring that I’d be able to get in a hard effort on the run, and that turned my head around a bit. I started the run chasing, as my friend Mitch told me I was down :45. But Mitch on the sidelines is my lucky charm; he is a coach and seems to have been there at nearly every Ironman I’ve done in the last couple years. He is also one of the hardest athletes I know, so I always take to heart whatever words he has to offer. Yesterday I began running and wasn’t sure that I’d be able to regain the lead, but Mitch reassured me that :45 was “nothing, and it would be no problem.” I chose to believe him, and just set my eyes on Magali down the road and envisioned myself being pulled up to her. It was amazing how easy it felt to run 6:40 miles after running just a bit quicker pace last weekend. I was sure that I was creepin, and didn’t even check my split til 3 miles in because I wanted to save myself the discouragement. But then I saw 20:00, and a couple miles later I was able to take over the lead, and it was cruisey from there! I enjoyed the chase on the run and a steady, pretty hard effort after that. Being able to see so many friends in the race and on the sidelines also added to the fun. This was my first real win! I guess I have now had a number of seconds and thirds, but besides the UCSB Sprint Triathlon–which I don’t really count–I’ve never actually won a race. So I have to appreciate that…and it was cool to share it with my dear friend Katya Meyers, who ended up finishing second, and kept me honest on the run. “My better half,” as we affectionately refer to each other, and I got to relive the glory days of our age group careers, when we used to travel to nearly every race together and frequently conduct our own training camps in which we would devise one unique physical challenge after another, stopping only when one of us was injured or otherwise rendered unable to move…We don’t get to train together much anymore, so it was great fun to be able to spend the weekend and race together again. I feel fine today and am back in Tucson for three days of training before heading to Panama City Beach on Wednesday. I am eagerly anticipating leaving it all on the road on Saturday. October 24, 2006: Back to racing! 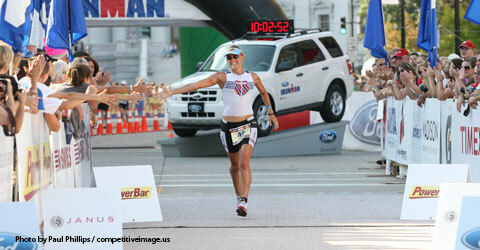 I am a happy girl because Ironman Florida is almost here, and I am now in the midst of three race weekends in a row. Since Ironman Wisconsin, I’ve been training in Tucson, Arizona. My friend Doug Friman has a place here, and although we don’t like being away from our coach and training squad, staying in the States between our fall races here seemed to be the best plan. With Dougie as my tour guide, I have had great training facilities and resources, and have really enjoyed my time in Tucson. The highlight has been a return to the club swimming roots of my childhood, as we do our swim training with the high school kids at the Ford Tucson club. For an ex-breaststroker, being thrown into the distance lane with the kids has been a humbling, but extremely beneficial experience. When I was a real swimmer, I did my training intensity self-check by asking myself when was the last time I had made myself feel like I was going to throw up in swim practice; if it hadn’t been recently, I wasn’t working hard enough! Trying to keep up with these kids, I have the pleasure of that old feeling nearly every session. I love it. Conveniently, the race was a point-to-point, so I just parked my car at the race finish in the dark, and ran the course backwards. Although I had to run through some sketchy city streets that were not so well-lit, to say the least, I was loving every minute of my pre-dawn adventure. I just kept thinking that there was nothing I would rather be doing; I mean, if there is anything I love more than a long run, it’s a race, and Sutto had devised a 2-in-1 for me! I thought I might be a bit tired at race start, but I wasn’t, and since I have zero speed, I just went as hard as I could from the go. And probably because I have no speed, I was able to run the same pace the whole way: my first mile was 6:22, and that also ended up being my average pace per mile. I think my 5-mile splits were 5 seconds apart. So my final time was 1:03.46, which was much better than I had anticipated, especially for miles 11-20 of my running adventure! It was nice to have confirmation that my training is on track in spite of being away from my coach–a good confidence-builder two weeks before my next big race. I get to put in another solid week of training this week, and then have another hard workout at the SOMA Half Ironman in Tempe next weekend. I am looking forward to it!